Sandridge Food Corporation is a major regional producer of deli style potato and macaroni salads, premium “protein” salads such as chicken and seafood salads, and deli-style soups. Located in Medina, Ohio, the company was founded in 1965 by Vincent Sandridge and has grown to more than 400 employees, with annual sales exceeding $50 million. Under the leadership of Mr. Sandridge’s oldest son, Mark, sales have doubled since 2002. CIFT has a long history of working with Sandridge, and has helped them develop custom washing and processing equipment that contributes to their commitment to food safety and purity. High Pressure Processing (HPP) system in the nation; this investment included the facility in which the system would be housed. In anticipation of future need for more HPP systems, Sandridge built a facility big enough to house three of these enormous systems. Then in September 2013, the facility investment paid off when they installed their second HPP system – a $5 million investment. 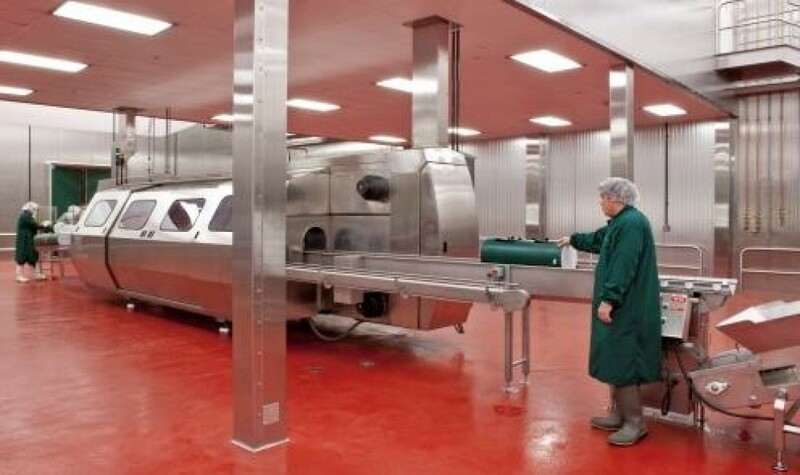 HPP technology is capable of destroying pathogenic bacteria non-thermally, through the use of isostatically applied pressure, thus enhancing safety and extending shelf life while maintaining freshness of products. The use of these systems has allowed Sandridge to extend the area to which they can market their products, and had enabled them to grow their business significantly by adding large West Coast customers, which would not have been possible with their previous processing technologies. These additions have established Sandridge as a technology leader in their industry. "We have committed to this technology, not only because food safety is our highest priority, but because we firmly believe that foods with fewer preservatives and clean labels is the right thing to provide to the consumers of today," said Mark D. Sandridge, chief executive officer, Sandridge. "Consumers want to be able to read labels that contain simple ingredients. With HPP, we are able to deliver culinary products that the consumer can feel good about with recognized and trusted ingredients, while still maintaining the highest degree of food safety, taste and nutrition." CIFT is assisting Sandridge in identifying other food processors that could utilize the HPP facility for their products, thereby contributing to the economic performance of the system, and further enhancing Ohio as a center for advanced food processing technologies. As a result of the HPP project and other initiatives, Sandridge has been able to increase their annual sales by more than 10 percent, and employment has increased by 110 full-time employees in the past five years. As work continues to further refine the HPP system with CIFT’s assistance, both sales and employment continue to increase.